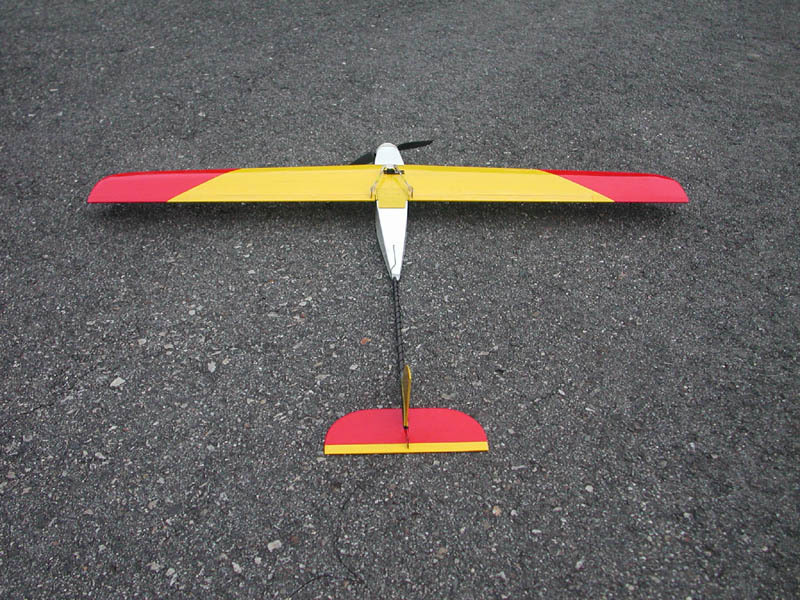 Clipped wing flew great - nice and fast, and much better roll rate. Handlaunches were still easy. Unfortunately I dorked it in doing laps at the field and totaled it. I'll have to build another later, after I do repairs to the other 2 planes I crashed the same day. Replaced the Zagi speed 400 motor, which I suspect was reverse timed, with a Graupner stock speed 400 motor. Improvement was noticable, and the plane now flys with authority, but not blindlingly fast, still only moderate. Carbon spoon prop still the best. The airfoil may be too thick, but I can't slim it down without building another wing, so the next best thing is to clip 3.5" off of each wingtip, turning the hotliner into a more traditional pylon form factor. I'm hoping the shorter wing will significantly reduce the drag without making the whole thing into a large brick. We'll see how it flys on Wednesday. Maiden flight - flew fine, but much slower than I expected. 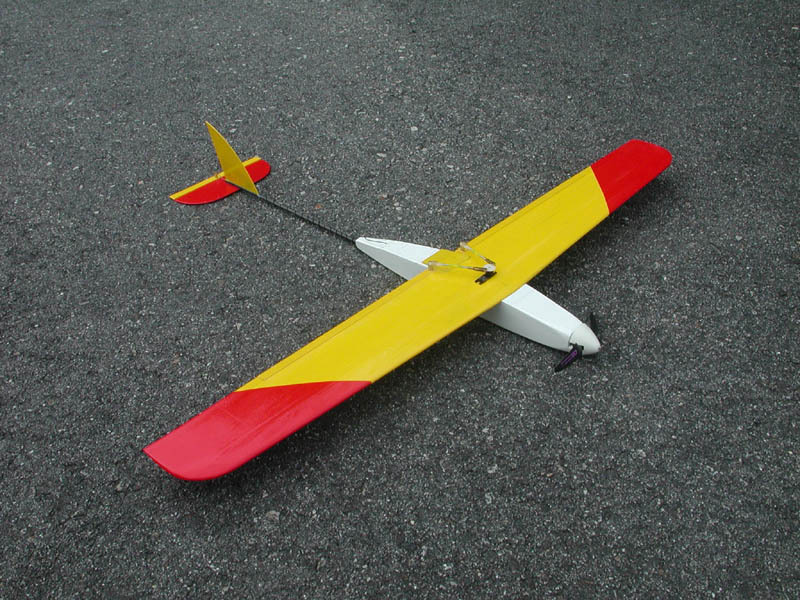 Best with carbon Gunther style spoon prop but topped out around 25-30 mph - maybe the wing is too thick, or that servo is slowing things down - I don't know which yet. Needs more work. It flys fine as a parkflyer, but I really wanted it to be much faster. Since I finished my E-3D I finally had time to work on my next "tweak out Jim Sarette" project. This is an Al's skunk works special. No plans, just start hacking at balsa carving away what doesn't look like a speed 400 hotliner. 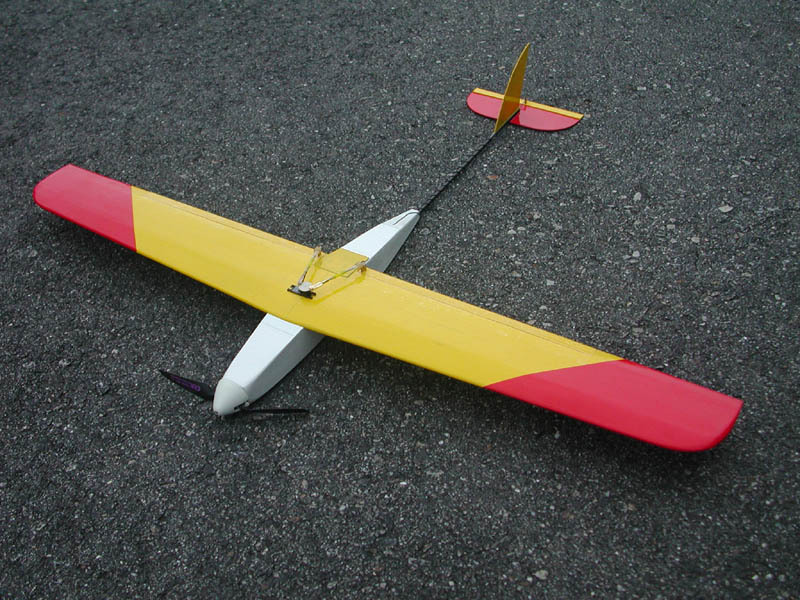 The wing is solid balsa with 2" strapping tape on the underside covered with regular covering. The fuselage is 1/16" sheet with a couple lite-ply formers and a CF arrowshaft for the boom. Power is 6-volt Trick-R/C speed 400 motor with 6x3 folder (for now) and 8x600AE cells. I wasn't sure about the size of the tailfeathers so I hope I guessed right! Another concern is the control throws since I have no idea what they should be. The aileron servo had to go on top of the wing because of the size of the fuselage pod. We'll see how it effects the speed with the exposed pushrods.